Austinites are many things. They are talented musicians, professionals in the growing tech industry, diverse families, and protectors of local businesses. Austinites are also informed and progressive citizens, adopting “clean-air city” policies to promote no-smoking ordinances, and gaining a reputation as one of the most bicycle-friendly cities nationwide. In 2017, U.S. News & World Report named Austin the #1 place to live in the country. Forbes called it the #1 city of the future in 2016 and the #1 “next biggest boom town” in America in 2017. As the city grows, many general contractors are creating sustainable, modern, and creative home designs that represent who homeowners are and the things they value, considering details like which eco-friendly materials to use in the floors and adopting bathroom designs that are beautiful, functional, and suited to modern-day family life. The kitchen may be the heart of the home, but anyone with experience remodeling a bathroom knows that the bathroom can be an oasis, a sanctuary, and a work of art. Below is a list of Austin bathroom remodeling contractors chosen for their high-end projects, years of experience, and awards and accolades. Debbie Adams, founder of Adams Company, started gaining experience in building while working for Ray Tonjes, a high-end custom builder, in 1987. Adams Company, a Certified Aging-in-Place Specialist, Certified Green Building Professional, and Certified Graduate Builder, offers additions and kitchen and bath remodels. Their service areas include Georgetown, Lakeway, and Austin. They are affiliated with the National Association of the Remodeling Industry (NARI), the National Association of Home Builders (NAHB), the Texas Association of Builders (TAB), and the Home Builders Association (HBA). Adams Company has received several awards for remodeling projects, including six NARI Contractor of the Year awards between 2016 and 2017. 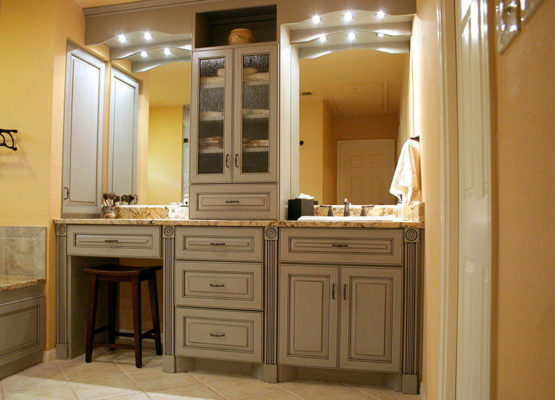 While most of the company’s honors have been for kitchens, its bathroom remodels are another one of its primary areas of focus, placing them among outstanding bathroom remodel contractors. A project on Hyridge Drive includes a large soaking tub lined with marble, large gray floor tile, and a modern shower encased in glass. A white double vanity is positioned in front of a red wall, with storage space cleverly built in between two mirrors. In a bathroom remodel on Rising Hills, Adams Company added a shower with decorative tile as its flooring. The tile matches the frame around a large vanity filled with storage space. Statewide Remodeling was founded in 1994, and since then, the company has finished more than 40,000 construction and home remodeling projects in Texas. They have been ranked the largest remodeling company in the entire state, and also the 18th largest remodeling company in the country. The company installs more than $50M-worth of projects annually. They operate out of Dallas, San Antonio and Houston as well as Austin, and they specialize in kitchen and bathroom remodeling. Statewide Remodeling offers high-end services designed to suit houses of all styles and at a variety of bathroom remodeling costs. Their team of experts believes that bathrooms should be beautiful and also functional, as they are both a sanctuary and a valuable asset to each home. The contractor assists with all matters and stages of the bathroom remodeling process, from full-service remodels and quick bath remodeling to tub-to-shower conversions and installation of shower enclosures. One project featured on their website boasts a dramatic, wide-set and freestanding soaking tub, whose rectangular shape fits neatly into a natural stone-covered recess with large windows. Other projects include rich wood cabinets with decorative patterns, and encased glass showers filled with sophisticated white marble. This company is run by President Zach Savage, who grew up learning building skills and craftsmanship from his Father and Grandfather in North Carolina. With a degree in business from the University of North Carolina at Wilmington, he has worked on multiple homes worth millions of dollars. This team works in collaboration with some of the finest architects in Texas to produce creative and luxurious homes, and their building projects have received 3 Max Awards: two for Best Custom Home $500k to $750k in 2017 and 2018, and another for Best Master Bath Under $50,000. That award-winning bathroom is located within a large Hill Country residence, mid-century modern in style. Zach Savage Homes worked with architect Nick Mehl from Element 5 Architects to collaborate on bathroom remodeling ideas. In one project, they created a spacious bathroom with a round, freestanding soaking tub and double vanities connected by one large mirror and industrial-style faucets. A large shower is encased with glass. In another building project located in Zilker, Zach Savage Homes worked with Element 5 Architects again, this time to create a contemporary bathroom with modern bathroom lighting fixtures, a wall-to-wall window above a set of double vanities with marble counters and recessed mirrors, and a white-tiled shower with a window overlooking lush trees. Guillermo Carrillo has 20 years of experience in the construction industry. He founded Lecasa Homes in 1998 with the goal of incorporating functionality and sustainability into modern-day life for families. Lecasa Homes started out doing small-scale remodeling projects but has grown to provide large-scale renovation projects for million-dollar homes. The company’s work has appeared on HGTV, and they are affiliated with the HBA, the NAHB, and TAB. In 2017, Lecasa Homes received a Max Award for Best Master Bath Remodel for a residence in North Hills. It features a tasteful vanity, a large glass shower with rich interior tile covering one wall, and a narrow and rectangular soaking tub with a curved perimeter. In another project that earned a Max Award for Best Remodeled Project, Lecasa Homes worked to update the interior of a 1950s ranch-style home in Westfield. The bathroom is luxurious, with a large tub separated from the rest of the spacious bathroom by a glass frame. Lecasa Homes has provided residential building services throughout a number of areas, including Mesa, Oak Forest, Greystone, Vallecito Cove, and Woodcrest. Soledad Builders, an Austin-based luxury home builder and remodeler, was founded by Marc and Kelly Molak. This family-run construction company, highlighted for its commitment to sustainable building practices and excellent bathroom remodels, has finished more than 100 residential building projects in and around Austin. Marc, a Texas native, has been engaged in the building industry since 1989 and has built over 1,000 houses. He holds a degree in construction management from UTSA, and he is a Certified Green Professional through the NAHB, as well as Green Boots Certified through Austin Energy. Kelly is a second-generation builder and has been both a lecturer and mentor of Green Boots methods for the past few years. Soledad Builders is affiliated with TAB, Custom Builders USA, the Austin Area Conservation Council, and the NHBA of Austin. Soledad bathrooms reflect the many varied needs and personalities of each of their clients. Some are contemporary, with modern lighting fixtures over marble vanities. Others are cozy powder rooms filled with subway tile. One of their bathroom remodel projects was honored with a NARI Contractor of the Year Award for a Residential Bath $50,000 to $75,000. Silverton Custom Homes, founded in 1993 by Mike Grimm, is a family-run business whose team has a cumulative 90 years of construction experience. Today, Mike is joined by his wife; his son Jason, who studied business at the University of Texas; and his son-in-law Chris Willeford, who studied construction science at Texas State. Silverton Custom Homes has received a great deal of accolades for its high-end custom houses and remodels, including a 2017 Max Award for Best Master Bath in a Custom Home $50,000 to $75,000. They have been named Developer of the Year by Greater Austin HBA, nominated as Builder of the Year by the Austin Business Journal, and selected as Southern Living Magazine’s Builder of the Year. Their bathrooms are grand and artistic, with features such as large marble room dividers, intricate chandeliers, and freestanding soaking tubs with antique fixtures and curved, sloping edges. Many have contemporary sinks made of colorful stone, and one of their bathroom remodel projects features Roman columns between a set of matching vanities facing one another. The columns lead to the tub area, the bathroom’s centerpiece, beneath an elegant chandelier. Watermark & Company, founded in 2004, is a full-service design-build company that provides custom homes, whole-house renovations, additions, interior design, and kitchen and bathroom remodels. The company has received over 10 awards through organizations like TAB, NARI, and HBA. 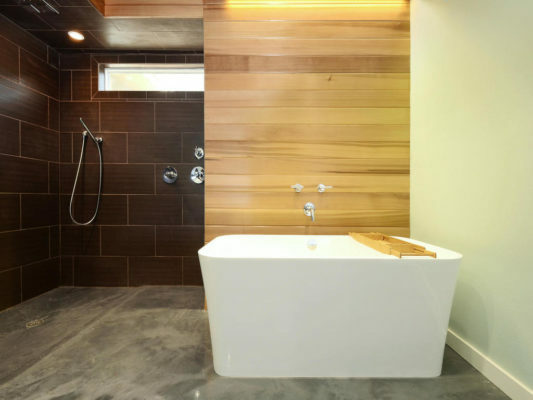 They excel at bathroom remodels, with a 2010 HBA Max Award for Best Master Bathroom Remodel and a 2009 NARI Contractor of the Year Award for a Residential Bath Under $30,000. One bathroom project at a Westlake residence features large floor tile to make the space feel bigger, and a wide soaking tub decorated in intricate tile patterns. A residence in West Austin features a luxurious shower encased partly by glass and partly by large stone, while a bathroom remodel in Rollingwood includes an elegant double vanity with marble counters. The company is run by Co-principals Jimmy Gallagher, who has a degree in mathematics from Angelo State University, and Louis Sanchez, who studied engineering at Texas Tech. Both are from Texas. Gallagher is a veteran of the US Air Force, and Sanchez grew up gaining hands-on building experience by helping construct his family’s home under his father’s supervision. Austin Impressions is a full-service design-build contractor that specializes in whole house renovations, additions, outdoor living areas, and kitchen and bathroom remodels. With more than 20 years of experience in business and in leadership roles, John Gehlken, owner, has acted as a board member of NARI’s Austin Chapter. He is active in yoga and meditation, and he prioritizes customer service and a detail-oriented approach to every home improvement project. Some of their many honors and recognitions include NARI Contractor of the Year awards for Interior Elements Under $30,000, a Residential Addition $100k to $250k, and an Entire House $500k to $750k. Bathroom remodel projects are one of their strengths, with a NARI Contractor of the Year Award for a Residential Bath Under $25,000. In a bathroom project at a Northwest Hills residence, Austin Impressions replaced a bland, 1980s bathroom with a spa-like sanctuary evoking tranquility and luxury. They added French doors, natural stone and marble, and a glass-encased shower with rain shower head fixtures. They also added a stand-alone pedestal bathtub. RRS Design Build provides new custom homes, whole-house remodeling, and kitchen and bath remodel services throughout the Austin area. Operated by Randy and Cara Stringer, RRS Design’s work has appeared in Qualified Remodeler multiple times, and their projects have been honored with over 10 awards and recognitions. RRS excels in new bathroom designs, with two Max awards for Best Master Bathroom Remodels, a 2016 Master Design Award for Best Bathroom Remodel Under $50,000, and three NARI Contractor of the Year awards, for Best Bathroom Remodel Under $30,000 and for one at $25,000. Their work was also featured in “Austin’s Best Bathrooms” in Austin Culture Map. Randy has been building for most of his life, ever since he studied under his father, a recognized builder in the state of Texas. Cara, who has an MBA and a Texas realtor license, has been designing houses since she was young, when she used to sketch her dream homes and then polish them through feedback from her father, a New England architect. The two came together after Randy returned to Texas, following several years of experience building multimillion-dollar homes and buildings in San Francisco. A family-run contractor with more than 30 years of experience in Austin’s building industry, Audino Construction has earned over 20 awards and honors for their renovation and remodeling projects. They have been named a Top 50 Remodeler by Remodeling Magazine and named TAB’s Central Texas Remodeler of the Year. The company is run by President Debbie Audino and Principal Mark Audino, a second-generation builder who has been building since he was a child. Of their many awards, four recognize excellence in bathroom remodeling: a TAB Star Award for Best Bath over $50,000, an HBA Max Award for Best Master Bath Remodel, a NARI Award for a Residential Bath over $60,000, and a Lone Star Award for Best Bath over $30,000. Audino Construction bathrooms are luxurious and artistic, with features such as wide-set and freestanding bathtubs in bright colors, contemporary frosted glass sinks, and full marble showers. Their remodeling work has been featured in several publications, such as Austin Home & Living, Qualified Remodeler Magazine, Austin Urban Living Magazine, and Stone Dimensions Magazine. They are affiliated with NARI, NAHB, HBA, and TAB. Top-Notch Renovations was founded in 2007 by Robert Petty, who has a background in the IT industry. Now an experienced builder and member of NARI, Robert is also EPA Lead-Paint Certified and a Certified Remodeler. Robert runs the company with both Lana Petty, who holds a marketing degree from Texas A&M University, a master’s in market research from UT Arlington and is a Certified Remodeling Project Manager, and Jenny Silverman, a Certified Kitchen and Bath Remodeler, Universal Design Certified Professional and Certified Remodeling Project Manager. 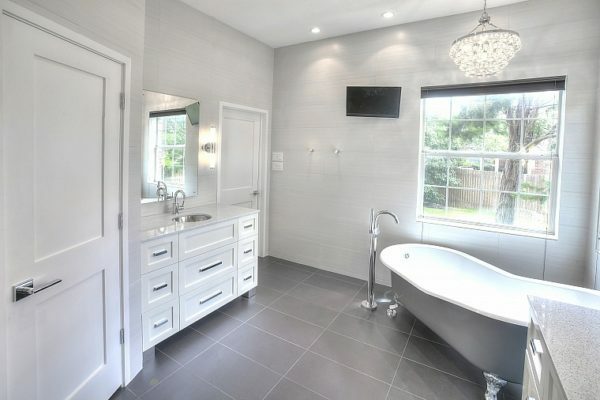 Bath remodels are one of their areas of excellence, with some of their most recent awards including NARI Contractor of the Year awards for a Residential Bath $50,000 to $75,000 and one Residential Bath Over $100k. A bathroom in Clear Springs started out with outdated features, plain tile, and worn-down cabinets. Top-Notch turned it into a dazzling and modern bathroom, featuring floor-to-ceiling shimmer tile, two sets of matching vanities with stylish metal sinks, and a freestanding kidney-shaped tub beneath a sparkling chandelier. Realty Restoration, founded in 2001, is operated by David Davison: a Master Electrician, Certified Remodeler, and Certified Kitchen and Bath Remodeler with more than 30 years of experience in the construction industry. In 2009, he was joined by Christopher Davison, who gained a master’s degree in architecture from Texas Tech University. Through their years of serving Austin, they have earned over 50 awards through organizations like NARI, Chrysalis, and Qualified Remodeler for their renovation and remodeling projects. 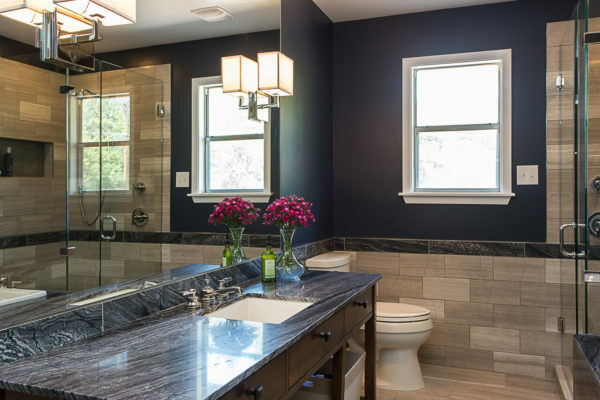 Several of their awards highlight their outstanding work on bathroom remodels in particular, such as their 2016 NARI Contractor of the Year awards for a Bath Remodel $50,000 to $75,000 and a Residential Bath $75,000 to $100k. In a large-scale Balcones Drive project, Realty Restoration incorporated a portion of the existing bathroom into a brand-new walk-in closet for the master bedroom. They created a new bathroom, 8 by 16 feet large, with a walk-in shower, a soaking tub, and high transom windows with views overlooking tree-filled scenery. Smooth, honed travertine floors and wall tile create a sense of tranquility and elegance. CG&S — “Clarence Guerrero and Sons” — was founded in 1957. This residential design-build contractor is a family business that was operated by founders Clarence and Stella Guerrero until their children took it over in the 1990s. Now, Billy Guerrero is the company president and co-owner, while Dolores Guerrero Davis is the general manager. Dolores’ husband, Stewart Davis, helped grow CG&S into a full-service design-build firm when he joined the company as an architect, and currently serves as co-owner and head of sales and estimation as well. CG&S has finished hundreds of building projects in the Austin area, with a great deal of recognition for their new bathroom and bathroom remodels. Between 2014 and 2017, CG&S received five NARI Contractor of the Year awards for bathroom projects alone, including Residential Baths $50,000 to $75,000 and $75,000 to $100k. In a project in Balcones Heights, CG&S worked to update and beautify an outdated guest bathroom in a mid-century, ranch-style residence. They added quartz counters, intricate storage niches built into the walls, and white-and-gray swirl marble tile from floor to ceiling. CG&S is affiliated with the American Institute of Architects, the National Kitchen and Bath Association, the HBA, and NARI. Corias Homes is a family business specializing in luxurious residential homes in upscale parts of Austin. Founded in 1982 by Keith and Debbie Schoenfelt, the company has earned several awards for their building projects on multimillion-dollar homes, some containing designs inspired by the homes of Frank Lloyd Wright. Their bathroom designs are elegant, boasting floor-to-ceiling tile or marble, traditional wood beams on raised ceilings, and large symmetrical mirrors facing another to make the rooms feel brighter and more spacious. Corias Homes received a Star Award for Best Master Bathroom for a Home over $3M and a Star Award for Best Interior Master Bathroom for a Home Over $1M. Debbie, the company’s president, has a background in microbiology, while Keith was one of Texas’s very first environmental engineers, bringing with him 30 years of experience in green building practices. They run Corias Homes with their daughter, Aria, who was raised in the construction industry. Today, she is a real estate consultant with her own brokerage firm. The team works with Texas’s best architecture firms to construct high-quality custom homes with award-winning and luxurious bathrooms. David Wilkes Builders is operated by David Wilkes, a green building professional who studied engineering and the built environment at Wolverhampton University in England. Each of David Wilkes Builders’ bathrooms is a unique work of art. In their bathroom remodel project in Preston, David Wilkes Builders considered how every element in the existing bathroom interacted with the space as a whole. They added a small and chic bathtub and large floor tiles to make the room feel more spacious, and they used a light gray color palette to inspire a sense of lightness and openness. They installed a shower with a dated enclosed tile wall framed with contemporary glass, enabling natural light to pour in, and they added an ivory Caesarstone apron for a clutter-free counter. The company’s work has received nearly 30 awards through organizations like NARI, Chrysalis, and the HBA of Greater Austin. More than five of its home improvement awards recognize excellence in bathroom designs, such as their multiple 2012 Texas Star awards for Best Bathroom Renovations Over $50,000, Over $75,000, and Over $300k. 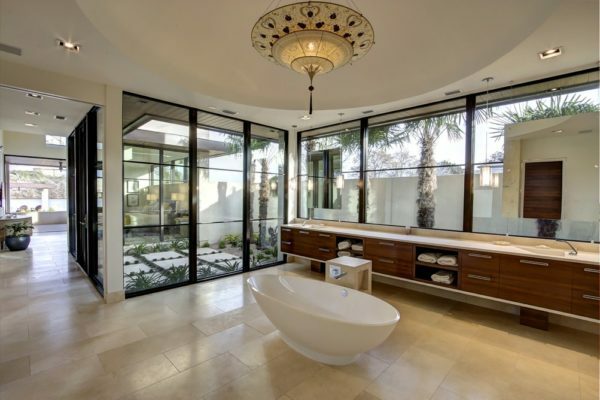 In 2012, the HBA of Greater Austin also selected them as an Excellence Winner in the Best Master Bath Remodel category, and they received the 2015 HBA Remodeler of the Year Award. Their work has been featured in many publications, like Symmetry Magazine, Texas Home & Living, Western Art & Architecture, Professional Remodeler, and Urban Home.